Globe Telecom is introducing a new application for all Android users – GMESSAGE. 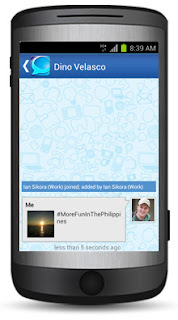 The app allows users to send free messages to users who have the same application. Also, it gives discounted short messaging service (SMS) fee if user wished to send a message to someone not registered to GMESSAGE. Initially, the app is available in Google Play Store for Android users. Other platforms may soon be added as well. The free message service is only applicable to messages sent within the GMESSAGE network. If you’ll be sending a message to someone who’s not yet registered, the system will charge you the default discounted SMS fee of PhP 0.15. Currently, this ability to send SMS to friends who are not using the app is only open to Globe subscribers. Similar to a familiar multi-platform app Viber, GMESSAGE works well if you have an active data plan or connected to a Wi-Fi network. If not, the message will be retrieved or sent when the app detects a stable Internet connection. As of this writing, the app is rated 4.2 out of 5 on average. If you want to know more about the app, click here. You may download the app from this link. Feel free to rate the app per your experience as well on Play Store.